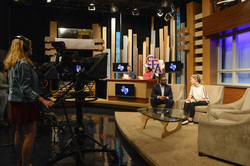 Stephen F. Austin State University's Department of Mass Communication recently completed significant facility upgrades to both the broadcast signal and on-campus studio for its television station, SFA-TV2. The station airs on Suddenlink's Channel 2. NACOGDOCHES, Texas - Stephen F. Austin State University's Department of Mass Communication recently completed significant facility upgrades to its television station, SFA-TV2. The station airs on Suddenlink's Channel 2 in Nacogdoches and surrounding East Texas areas. The TV station serves as a laboratory and classroom for students seeking a degree in broadcasting. Supporting the academic mission of the department, SFA's Board of Regents and administration allocated $275,000 for the project, which included upgrades to both the broadcast signal and on-campus studio. "The studio modernization bolsters our efforts to build and maintain teaching and training facilities that mimic those our graduates will one day work in," said Dr. John Hendricks, chair and professor of the mass communication department. As part of the upgrade, the station converted all studio operations to high-definition quality, which brings the station into compliance with modern broadcast industry standards. In addition, the studio's new state-of-the-art LED lighting provides both energy efficiency and better quality for students' video production projects. "I think viewers will immediately notice a clearer visual and audio presentation," said Dr. Casey Hart, associate professor of mass communication and SFA-TV2 faculty advisor. In addition to Suddenlink's Channel 2, the station's programming also can be viewed online via UStream at http://www.ustream.tv/channel/sfa-tv2-jack-tv, and individual student-produced programming can be watched on YouTube at JackTVSFA.